Well, the big news is that WEEEEEE did it! 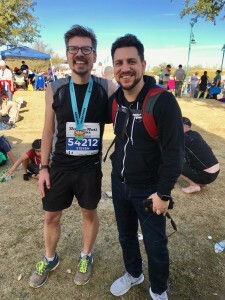 After only 8 years, Steven finally accomplished the goal of a Sub-5 hour marathon, and Anthony was there to see it. Join them as they talk through the race from before the start (“What’s your go-to channel at a hotel?”) to after the finish (“It’s the chocolate milk that’s really making me feel like puking right now.”) and everything in between (“I thought I was going down, and if I did, I wasn’t going to be getting back up”). 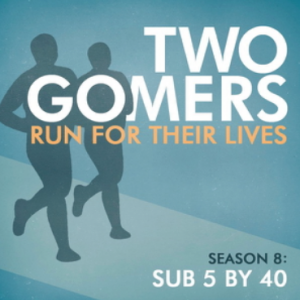 Also, get ready for the most tangents per episode maybe ever, culminating in a conversation that bounces between Carrie Fischer’s screenwriting chops, Kevin Kline’s ownership of a running business, and Rob Lowe’s sweaty saxophone skills (and sometime all those things at once). It’s an instant classic you won’t want to miss! We’ll be back with mid-season finale or two, not to worry. Happy Listening, and Happy Running!